From the south: Take I-91 North to Exit 14. Take a left off the exit and then continue thru two traffic lights and at the second stop sign turn left onto Christian Street. 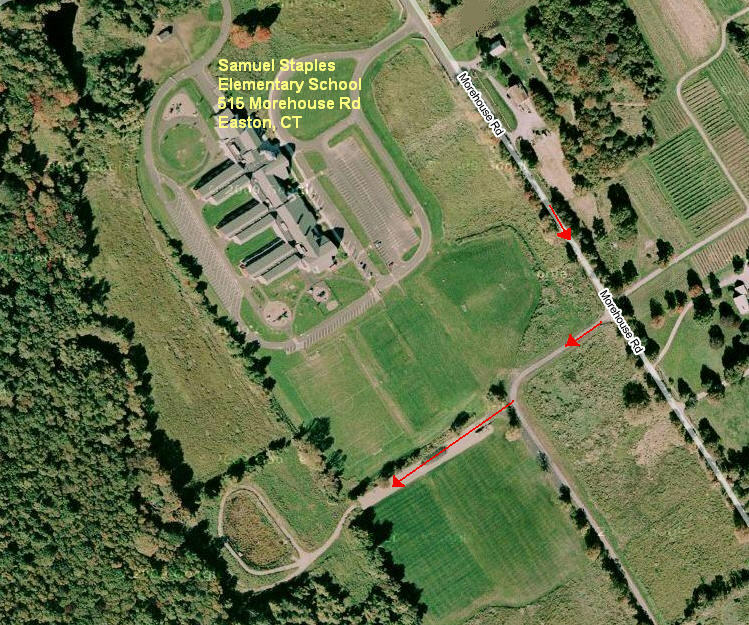 The entrance to fields 1 & 2 will be approximately 3/10 of a mile on your right and the entrance to fields 3-9 will be a 1/2 mile on your left. From the north: Take I-91 South to Exit 14. Take a right off the exit onto East Center Street. Go approximately 1 mile and turn right at the traffic light onto East main Street. (East Center market will be on the corner). At the second stop sign, turn left onto Christian Street. The entrance to fields 1 & 2 will be approximately 3/10 of a mile on your right and the entrance to fields 3-9 will be a 1/2 mile on your left. Take exit 46. At end of exit turn right onto Congress Street. At Stop light take left onto CT-59 Sport Hill Road. Continue approximately 2.2 miles and look for Town Green and firehouse on left and yellow general store on the right. Turn left onto Center Rd. At Stop Sign, turn left onto Morehouse Road. Easton Country Day School is on left (.2 miles). Take exit 46. At end of exit turn right onto Jefferson Street. At stop light, turn right at CT-59 North, Easton Turnpike (Sport Hill Rd). Continue approximately 2.2 miles and look for Town Green and firehouse on left and yellow general store on the right. Turn Left onto Center Rd. At Stop Sign, turn left onto Morehouse Road. Easton Country Day School is on left (.2 miles). Directions: Â 91 SOUTH To Exit 18 - 691 Waterbury West - off of 691 you will take Exit 8 - Broad Street Exit - At the end of the ramp take a right onto N Broad Street/CT-150/US-5. Continue to follow N Broad St/US-5 for .5 miles. Turn right onto Westfield Road, Falcon Field is about 0.6 miles on the right. 91 NORTH To Exit 68W - 691 Waterbury West - Off of 691 you will take Exit 8 - Broad Street Exit - At the end of the ramp take a right onto N Broad Street/CT-150/US-5. Continue to follow N Broad St/US-5 for .5 miles. Turn right onto Westfield Road, Falcon Field is about 0.6 miles on the right. Â 84 EAST To 691 Exit - Meriden East, Off of 691 you will take Exit 8 - Broad Street Exit - At the end of the ramp take a right onto N Broad Street/CT-150/US-5. Continue to follow N Broad St/US-5 for .5 miles. Turn right onto Westfield Road, Falcon Field is about 0.6 miles on the right. 84 WEST To 691 Exit - Meriden East, Off of 691 you will take Exit 8 - Broad Street Exit - At the end of the ramp take a right onto N Broad Street/CT-150/US-5. Continue to follow N Broad St/US-5 for .5 miles. Turn right onto Westfield Road, Falcon Field is about 0.6 miles on the right. Take Exit 47E; go to the ninth stoplight.Â Turn left at the ninth light onto North Maple Street.Â Fermi is approximately one mile on the right. Take Route 32 or Route 190 exit.Â Take Route 190 West, turn right onto Route 192 (North Maple Street).Â Fermi is approximately one mile on the right.Â Or go to I-91 and then follow the above directions. Take Route 44W to 32N to Route 190W.Â Turn right onto Route 192 (North Maple Street).Â Fermi is approximately one mile on the right. Take I-91 North or South to Exit #23 (West St. exit). Head west towards Rte 3. Take a RIGHT onto Rte 3 NORTH. At 3rd traffic light, take a LEFT onto Rte 160 (New Britain Ave; at CVS). At your first light, take a RIGHT onto Hayes Rd. Maxwell Park is about one mile on your right. To RHHS fields from Maxwell Park: Take a LEFT out of driveway onto Hayes Rd. At light, take a LEFT onto Rte 160. At next light take a RIGHT onto Rte 3. At next light, take a LEFT onto Elm St. Take a LEFT onto Chapin St. School is on your left. No parking near the fields except for a few handicap spots. To West Hill School from Maxwell Park: Take a LEFT out of driveway onto Hayes Rd. At light, take a LEFT onto Rte 160. Take the next left onto Cronin St. School is on your immediate left. To Sunnycrest Park from Maxwell Park: Take a LEFT out of driveway onto Hayes Rd. At light, take a LEFT onto Rte 160. At next light take a RIGHT onto Rte 3. At next light, take a LEFT onto Elm St. Take a LEFT onto Bailey Rd. At end of Bailey, take a LEFT onto Parsonage Rd. Entrance to park is on your left. To GMS fields from Maxwell Park: Take a LEFT out of driveway onto Hayes Rd. At light, take a LEFT onto Rte 160. At next light take a RIGHT onto Rte 3. At next light, take a LEFT onto Elm St. Take a LEFT onto Bailey Rd. Entrance to school is on your right. Exit 46 to end of ramp to traffic light. Take a right to next traffic light. You will be facing GE. Take a right, north onto Route 59. Continue straight approximately 2.2 miles. Look for Town Green, firehouse on left. Take left onto Center Road and then a slight left onto Banks Road. At first stop sign, take a left onto Morehouse Road. Samuel Staples Elementary School will be on the right, take first right after school. Exit 46—Bear right at bottom of ramp to traffic light. Take left onto Route 59 north. Continue straight approximately 2.2 miles. Look for Town Green, firehouse on left and yellow general store on the right. Take left onto Center Road and then a slight left onto Banks Road. At first stop sign, take a left onto Morehouse Road. Samuel Staples Elementary School will be on the right, take first right after school. Take Exit 25 off I-95 (Fairfield Avenue). At bottom of ramp, take a right onto Fairfield Avenue. Go under railroad underpass and take an immediate left onto State Street. Take second right onto Dewey Street which becomes Briarwood Avenue when it crosses North Avenue and ending when it bears left onto Brooklawn Avenue, which becomes Stratfield Road at the Fairfield line (Route 59), which becomes Easton Turnpike, which becomes Sport Hill Road when you pass over the Merritt Parkway. This is all Route 59 with several name changes. Look for Town Green, firehouse on left and yellow general store on the right (This is approximately 2.2 miles from the Merritt Parkway). Take left onto Center Road and then a slight left onto Banks Road. At first stop sign, take a left onto Morehouse Road. Samuel Staples Elementary School will be on the right, take first right after school. Route 63. Left on Country Club Road. From New Haven: Route 63 North to Country Club Road or Route 69 North to I-84 West. From Stamford: I-95 North or Merritt Parkway North to Route 8 North to I-84 West. I-91 North or South to Exit #24 (Rte 99- Silas Dean Hwy). Follow Rte 99 South for approx. .8 mile then take a RIGHT onto Parsonage Rd. Take first LEFT onto Chapin St for entrance to high school parking lot. Fields are behind school. There is no parking near the fields except for a few handicap spaces. Please do not park on the Basketball courts behind the school. At end of Exit take a left onto Silas Deane Highway. At 3rd light (.6 miles) take a Right onto Parsonage Street. Go .4 miles (will pass two streets, Chapin Avenue and Bailey Road). Entrance to park is on left side (5 driveways after Bailey Road) and is marked with blue sign. At end of Exit take a right onto Silas Deane Highway. At 4th light (.8 miles) take a Right onto Parsonage Street. Directions: From Hartford/Bradley International Airport (55 miles) South via Interstate 91 to Hartford; west on Interstate 84 to Exit 20; north on Route 8 (3.9 miles) to Exit 37; Turn left at bottom of exit ramp (route 262 west) for 1.7 miles. At second light, turn right (still on 262). After approximately 2 miles, turn left at 2nd light onto Rt. 6 west. Taft is located on Route 6, on the right, after the third traffic light (a little more than a mile). To reach the athletic center, proceed beyond the main campus and turn right onto Guernseytown Rd. The parking lot will be your second right. From New York City (90 miles) North via Hutchinson River Parkway to White Plains; north on Interstate 684 to Exit 9 east; east on Interstate 84 to Southbury, Exit 15; At bottom of exit ramp, turn left onto Route 6 east to Watertown (12 miles from exit 15). To reach the athletic center, proceed beyond the main campus and turn right onto Guernseytown Rd. The parking lot will be your second right. Take Exit 27- go straight to your third light and take a right onto Lafayette Blvd. At the end of Lafayette Blvd. Take aÂ right into the parking lot.Â Entrance to bleachers is located across from the team benches. Take Exit 1- (Myrtle Avenue): turn left at the light at the end of the ramp (Prospect Street).Â At the second stop light (you will pass the State Police Station), turn right onto Lafayette Blvd. and head South until you reach the end. take a right into the parking lot.Â Entrance to bleachers is located across from the team benches. Take Exit 49 (South) to Route 25/8 Connector to Exit 1 (Myrtle). Follow directions from 25/8 above. From the Merritt Parkway, head north on Route 59 (Sport Hill Rd). Continue straight approximately two miles. Take a right into Helen Keller Middle School entrance (360 Sport Hill Rd). Take the first left towards the Easton Community center. Veterans Field is located behind the ECC. Take Exit 57 (Route 34 East) directly to the Yale fields, or take Exit 59 (Whalley Avenue) and follow Yale Bowl signs to the Yale fields. Johnson Field is off of Central Avenue, located at the end of the driveway between the intramural fields and the Armory. Take Eastbound Exit 44 or Westbound Exit 45 to Route 10 and follow Yale Bowl signs (Johnson Field is across Central Avenue from the Yale Bowl, Class of 1954 Field). Or, take Exit 47 (Downtown) and follow Route 34 to the Yale fields. Make a right on Central Avenue, then a left into the first driveway on the left. Go north on Chapel Street, then bear left onto Derby Avenue (Route 34) to the fields. Make a right on Central Avenue, then a left into the first driveway on the left. Take Exit 1 (Downtown) and follow Route 34 to the Yale Fields. Make a right on Central Avenue, then a left into the first driveway on the left.